Other fantastic giveaway items slated for this season include a Texas Stars hockey puck presented by Austin Telco Federal Credit Union, military-style dog tags presented by Raising Cane's, a sweatshirt drawstring bag presented by University Federal Credit Union, hockey family window decals presented by Central Texas Regional Mobility Authority and a 2014 Stars calendar presented by The Parking Spot. Returning theme nights include Pink in the Rink, Military Appreciation Nights, Teddy Bear Toss, Sing for Santa and Pucks-and-Paws. Back this year are such giveaway items as the Texas Stars gym bag presented by Shoal Creek Dental, the car windshield sun shade presented by Capital EMS, team card set and team poster, while new items like ear buds with carrying case, cell phone dot and fleece ear warmers will be introduced. Supplies are limited for each individual giveaway item, so fans are always encouraged to arrive early. Popular returning promotions include H-E-B Nights (Monday - Thursday); Winning Wednesdays and Texas Lottery Lucky Row Nights (Saturdays). The Family Four Pack returns for Saturday games, presented by new partner Coca-Cola. On Friday nights, a favorite promotion has been expanded as the Texas Stars will now present $3 Beer & $4 Robert Mondavi Private Selection Wine specials. Entering their fifth anniversary season in the AHL, the Stars will begin their home schedule with two pre-season games at Cedar Park Center on September 27th against the Oklahoma City Barons and September 29th versus the San Antonio Rampage. During both exhibition games the Stars will hand out 2013-14 magnetic schedules to every fan in attendance courtesy of Austin Telco Federal Credit Union. The Texas Stars Opening Night follows on Saturday, October 5th as the team hosts the Chicago Wolves at 7:00 p.m. Fans will again have the chance to pick up a magnetic schedule and will also receive a commemorative fifth season baseball cap. Texas will also host a pair of Military Appreciation Weekends, each featuring a specialty jersey. November 8th and 9th is Stars & Stripes Weekend presented by Sport Clips as the Stars host the Milwaukee Admirals for a two-game set. The team will wear a Stars & Stripes themed jersey at both games, while Friday is the reusable shopping tote bag giveaway presented by ABC Home & Commercial Services and Saturday is the Stars & Stripes t-shirt giveaway presented by Sport Clips. Military Appreciation Weekend presented by Round Rock Auto Group takes place on March 21st and 22nd as the Stars don camouflage jerseys for a pair of games against Oklahoma City. On Saturday night fans will receive a Texas Stars camouflage hat presented by Round Rock Auto Group. The Fourth Annual Pink in the Rink Weekend takes place on February 21st and 22nd as Texas hosts the Charlotte Checkers. The Stars will wear specialty jerseys for both games and on Saturday fans will receive a Pink in the Rink Texas Stars hat courtesy of the weekend's presenting sponsor, Cedar Park Regional Medical Center. The Texas Stars Foundation will be holding a silent auction for the game-worn specialty jerseys all weekend long, with proceeds benefitting the Breast Cancer Resource Center. For the second straight year Pucks 'N Paws night will be held early in the season on Sunday, October 20th at 5:00 p.m. against the Abbotsford Heat. Fans will receive military-style dog tags presented by Raising Cane's. Cedar Park Center will provide special arena seating for all canines; more details will be released closer to the event. Teddy Bear Toss returns for the fifth consecutive year on Saturday, November 23rd against Toronto. 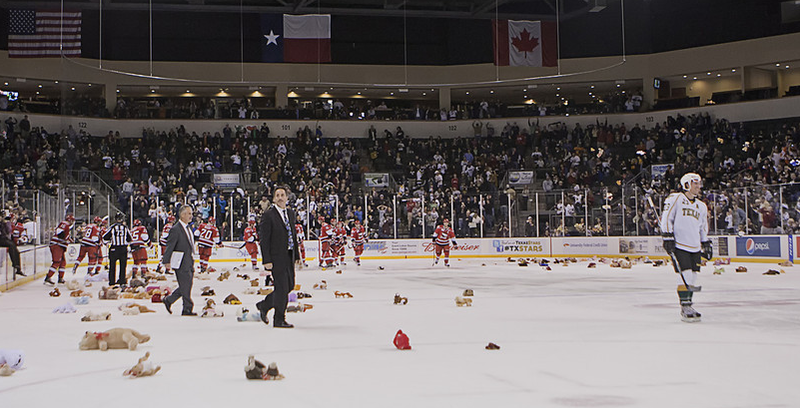 Fans are encouraged to bring new stuffed animals to throw on the ice in support of local charities. Additionally, fans receive a sweatshirt drawstring bag presented by University Federal Credit Union. Sing for Santa weekend takes place on December 6th and 7th as the Stars do battle with the Iowa Wild. To celebrate the holidays, local school choirs will perform holiday favorites during both games. Friday night is hockey family window decal giveaway night presented by Central Texas Regional Mobility Authority and Saturday night is Texas Stars lunch bag giveaway night presented by H-E-B. Fans will once again see the popular Family Four Pack for every Saturday home game, now presented by new partner Coca-Cola. The Coca-Cola Family Four Pack includes four tickets, four hot dogs and four Coca-Cola products for as little as $48. The Texas Lottery Lucky Row promotion also returns for every Saturday home game. When the first Stars player scores a goal, one lucky row in the corresponding section will win scratch-off lottery tickets courtesy of the Texas Lottery. H-E-B Nights return for all Monday through Thursday games throughout the season, featuring $5 off the ticket price for anyone who donates an H-E-B store brand non-perishable food item at the box office. $3 Beer Nights have been expanded this season to also include $4 Robert Mondavi Private Selection wine. At all Friday night home games fans may purchase 12-ounce domestic draft beers for $3 and may also choose from a variety of Robert Mondavi Private Selection wines. Also returning are Winning Wednesdays where, if the Stars win on a Wednesday night home game, all fans in attendance receive a free ticket to the next scheduled Wednesday home game.